Niagara Falls cardiac clinic opens on Main St.
NIAGARA FALLS – A Cardiac Diagnostic Clinic has opened on Main St. providing examinations for residents with high blood pressure, heart disease and other cardiovascular problems. It opened April 8 and is led by Dr. Masoud Goodarzi, an internal medicine professional who focuses on cardiology. He came from Kingston. Two secretaries have already been hired and Goodarzi said the plan is two hire up to two more, as well as one or two technicians to assist with the latest state-of-the-art medical equipment being installed. “This is for comprehensive cardiovascular examinations. Any person with a risk factor, like hypertension, diabetes, smokers, (people with) cholesterol problems, (with a) family history of heart disease …,” said Goodarzi. Goodarzi sees patients referred by doctors, meaning his clinic does not take walk ins. 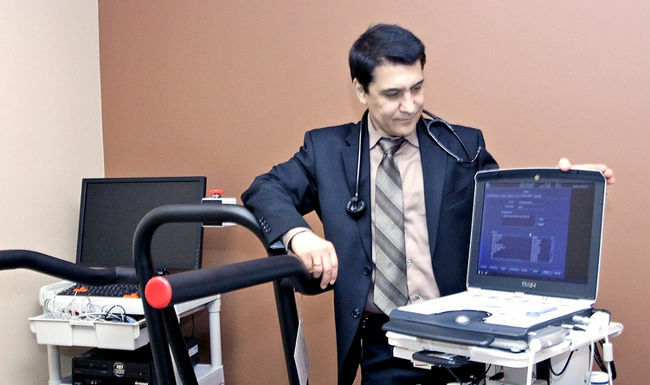 While at Goodarzi’s clinic, patients can receive stress tests, a sonogram of their heart and breath evaluations, among other treatments. Inside one cardio and stress-testing room, an ultrasound device is being synced with a treadmill that will help Goodarzi interpret how a patient’s heart is functioning. The room is also equipped with defibrillators, oxygen tanks and other medical appliances. Goodarzi said the 2,600-square-foot, two-storey building has seven rooms — five examination rooms and two offices. There is 900-square-feet of space upstairs, which is used as a presentation and lunch area. He said the size of the building could allow for future rental opportunities for other doctors. He said the benefit of constructing a building for his clinic, rather than renovating an existing facility, was that it was designed to be accessible to wheelchairs or stretchers. There are several doors around the building. Goodarzi said there is no other clinic in the city like his. “There is only one clinic in St. Catharines on a bigger scale like this. Otherwise, this is unique to Niagara Falls,” he said, noting there is a demand in Niagara Falls for such medical services. He said since it opened, the clinic has also seen referrals from across the region.